Staying away from diet and fitness fads is one of my tips from 15 Tips for Reaching Your Weight Loss Goals Faster & More Effectively. However, the ketogenic diet for weight loss came to my attention last year because the basic elements resembled my diet. This was purely a coincidence because I’m such a picky eater so I looked into the keto diet in greater detail and loved what I found out. The ketogenic diet is a diet that’s high in fat, reasonable in protein but low carb. This type of diet forces the body to burn fats rather than carbohydrates. With little carbohydrates in the body, the liver converts the fats into fatty acids and ketone bodies, which means the body uses the ketone bodies as an energy source instead of the glucose produced by consuming carbohydrates. The ratio of meals for the keto diet include 70% fats, 25% proteins, and 5% carbs. When your body is forced into a state of ketosis, a variety of things happen. They include weight loss, increased energy levels, healthier body and better mental and physical health. The keto diet is aka ketogenic diet, low carb diet, and low carb high fat (LCHF) diet. Meats, leafy greens like kale and spinach, above ground vegetables like broccoli, cabbage and cauliflower, high-fat dairy, nuts and seeds like sunflower seeds and almonds, low glycemic berries, sweeteners like stevia, saturated fats, etc. Any type of sugar, processed foods like chips, pretzels and cold cuts, prepackaged meals, soda, alcohol, fruit juices, sweetened drinks, etc. 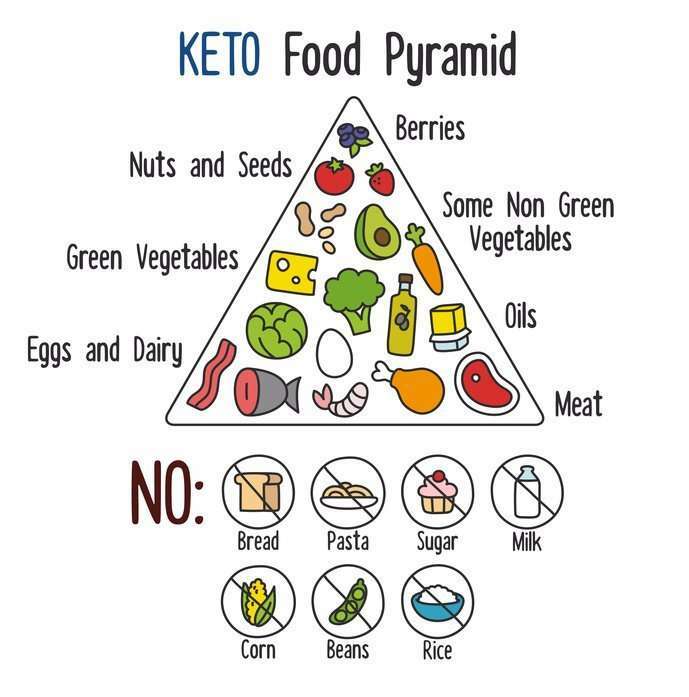 The keto food pyramid below gives a basic breakdown of the components of a keto diet. This doesn’t sound too restrictive of a diet so why would it cause hair loss? 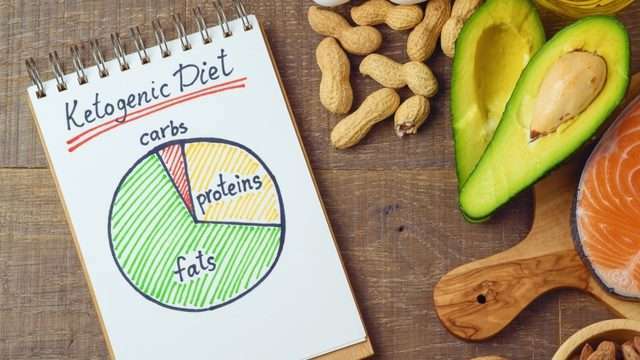 There is a lot of confusion regarding this and I conducted a bit of research as well as kept track of my own diet over the last three months. 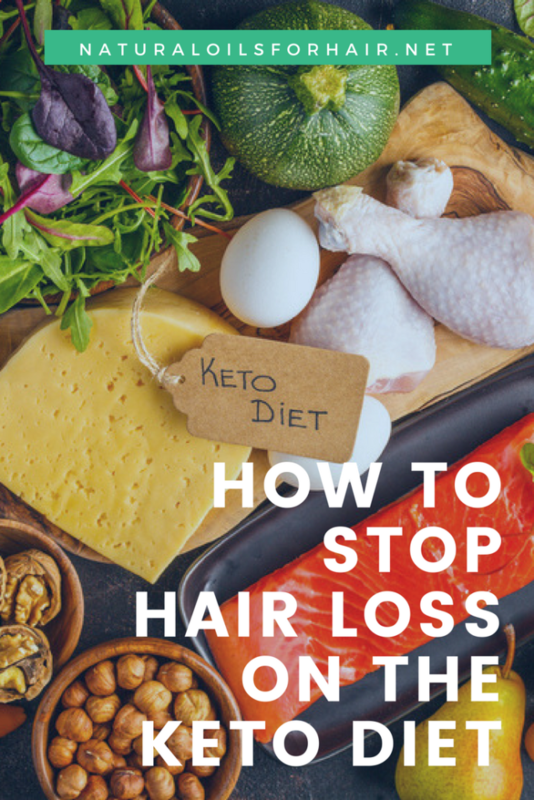 Yes, there is some hair loss while working on getting your body to a state of ketosis because any drastic change in diet, lifestyle, etc will affect your hair in one way or another. I covered this in great detail in The Ultimate Hair Growth Guide. The hair loss is not immediate and will usually appear after 3 – 6 months but don’t despair. The good thing is this hair loss is only temporary. Once your body adjusts to the new diet and reaches a state of ketosis, the hair loss will be eliminated. Personally, I didn’t suffer any hair loss tracking my diet over the last three months but this is likely due to the fact that I have been unconsciously practicing the keto diet for a very long time, and my body is pretty used to low carb meals by now. Keep in mind not everyone will experience hair loss while switching to the keto diet. It’s dependent on the kind of lifestyle you lived previously and how your body adapts to the new diet. Don’t panic and stop the keto diet. Once the hair loss starts, the cycle will be completed irrespective of what you do so stick to what you’re eating already. This is called Telogen effluvium, which is triggered by drastic weight loss. Don’t be draconian with what you eat. Ease into the keto diet gently. Don’t try to starve yourself or become a super keto dieter within a week. If you have additional stress in your life such as work stress or relationship stress while starting the keto diet, it’s helpful to eliminate these sources of stress as they can contribute to the hair loss. You may want to check your vitamin levels in case of any deficiencies, which may have occurred due to the new diet and correct them. Drink enormous amounts of water. I drink around 2.5 – 3 liters of water every day. Sip on water throughout the day whether you’re thirsty or not. You can also flavor it with slices of the preferential keto vegetables. There are suggestions that adding bone broth to your diet can help as well by restoring electrolytes such as magnesium, potassium or sodium lost during the process. Bone broth also contains a lot of amino acids, which is important for healthy hair growth. The most recommended bone broth is Ancient Nutrition Bone Broth Protein Powder. Do not turn into some kind of gym rat when starting this diet. You will lose weight by default while on the diet. By performing excessive exercise, you can trigger a hair loss episode. Some people find supplementing with things like biotin and a general multivitamin helps but before you do this, check your vitamin levels and discuss with your primary care physician. Every diet is not for everybody. Sometimes, your body just isn’t having it no matter what you do. If hair loss is still the case after a year, then maybe the keto diet is not for you. Consult with your primary care physician and/or a nutritionist. You can try some of the natural hair care and hair growth methods recommended in The Ultimate Hair Growth Guide and How to Grow Hair Healthy and Long with Natural Oils. If you’re wondering how this is similar to my diet, I gave up eating a lot of carbohydrates a long time ago because I found them too heavy. I’ve never taken to processed or canned food because my parents had a farm and everything I ate growing up was fresh. I also dislike soda, sweetened drinks, hard candy, chips, and cold cuts. The list goes on really. lol. As I said previously, this happened by default over the years because I’m a picky eater and it turned out to be a coincidence my diet somewhat imitates the ketogenic diet. I should mention my diet is not 100% ketogenic. I eat chocolate. I drink white wine and lattes socially and a few things here and there. I still maintain an overall healthy lifestyle. See some of my updates HERE.